With Christmas around the corner, we always focus on creating a memorable moment and one to ring on our minds for many years to come. One way in which we light up our surroundings to create an unforgettable moment is by getting Christmas lights for use during the holiday. When you decide to get Xmas lights, you will want to get the best on the market, those with lots of color effects and patterns to ensure that this can linger in your mind for a long time. 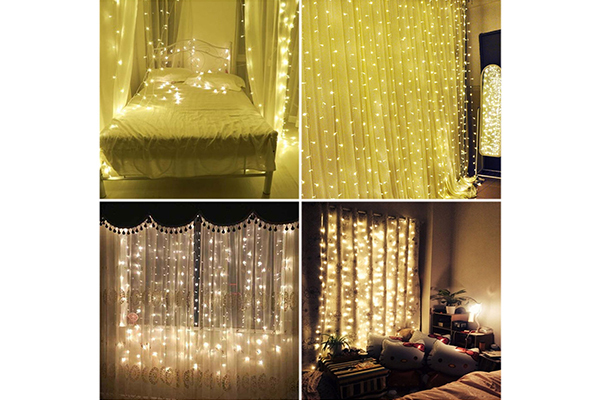 Moreover, you will want to get the lights that will entice your kids and those which you can use to decorate both the indoor and outdoor setting of your home. So, how do you go about selecting the best Christmas lights among the options on the market? You will need to consider the brightness level, the method of installation, color and lighting patterns, water resistance, power mode, durability, among other factors. In this article, we have reviewed the best lights for Xmas after considering these factors. 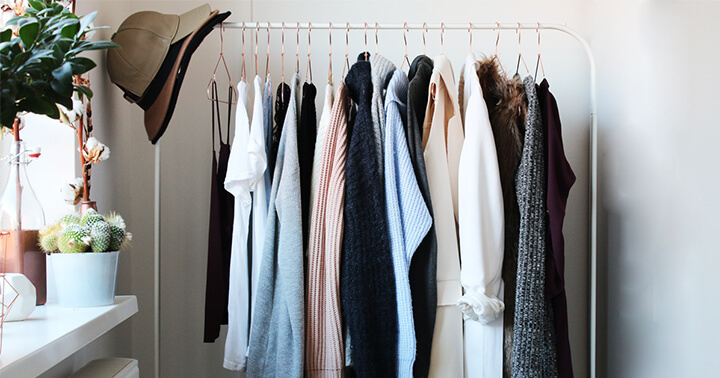 Have a look and determine if you can get the best based on your needs and budget. These are backdrop lights that are 10 feet tall equipped with 306 LEDs. They emit a high bright, soft light that contributes to a long lasting and energy efficient lighting solution. The bulbs are simple to install, since, with a simple plugin, you can be sure to have them lighting. They feature eight modes of lighting that will let you customize the setting to suit your venue. You can set them on Slo-Glo, steady on, sequential, slow fade, combination, chasing/flash, twinkle/flash, or in waves. Whats more is that they have a memory function. This lets them stay in the previous setting when you power them on or off. The lights are safe to touch due to the 30V low voltage output which makes them safe for use in a home with kids and pets. You can get them for hanging on walls, ceilings, Christmas trees, windows, floors, grass, among other places. As one of the best lights for X-mas, these lights are safe to use. They adopt a safety voltage operation so that you will never have to worry when using them in outdoor environments since they will never be a danger to people even when exposed to water. They are controller operated and feature a memory function that lets them remember the last setting before you turned them off. As such, they automatically go back the previous setting when you light them. 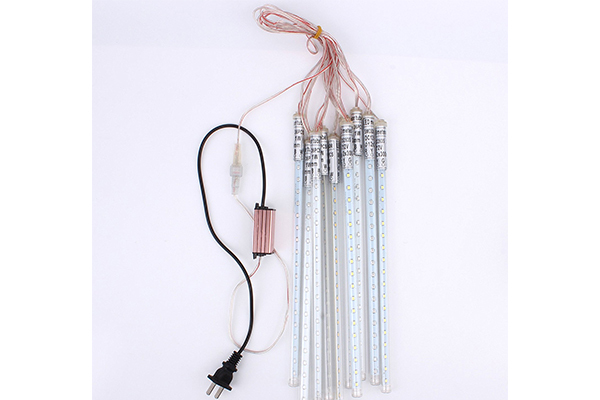 Due to the safety voltage operate, the LEDs are highly stable and emit less heat making them eco-friendly while enhancing a longer lifespan. They have eight lighting modes to allow you to use them in waves, combination, chasing/flash, slow fade, combination, sequential, Slo-Glo, twinkle/flash, and steady on. Hence, you can be sure to have lights that will let you change the lighting modes based on the mod and atmosphere. This makes them perfect for weddings, Chrismas, parties, among other celebrations. Are you looking for the best lights for Christmas to transform your setting? These are some of the best Xmas lights to consider. They feature a meteor effect and give a romantic aesthetic making them suitable for use in weddings too. The LEDs emulate falling snow while the light on each bulb turns on and out one by one and in a sequence making them attractive when added in any setting. The lights are built to last and provide you with the best value for money since they are of high-quality and energy efficient. They are also dustproof, corrosion resistant, and aging resistant making them ideal for use in an outdoor setting. They do not consume a lot of power so that you will never have to pay a lot of energy bills. The lights operate by plugging them, however, note that the plug is not waterproof. You can get them for Chrismas, valentines, weddings, new year parties, gardening, landscaping, urban night lighting, among other applications. 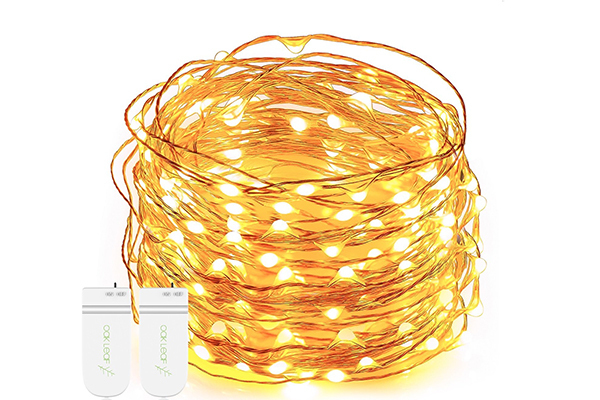 This is an 8M 50LEDs battery-operated LED string light. It features a high-quality material so that it can serve you for several seasons. The LEDs are star-shaped and very beautiful when lit up. They require 3 x AA batteries to operate. However, note that these are not included in the package. With these LEDs, you can benefit from eight different modes of lighting including in wave, slow fade, Slo-Glo, steady on, combination, sequential, chasing/flash, and twinkle/flash. The lights come with a remote making them easy to control. You can get them for installing on a Christmas tree, nursery room, fences, windows, wardrobes, among other places. As one of the best lights for Xmas, these bulbs are IP44 grade water-resistant and as such great for outdoor use. They come in three different sizes on a flexible 22.97ft string. This makes them suitable for swings, balconies, gardens, among other areas since the string enables you to twist them on trees, windows, doors, sofas, among other places. 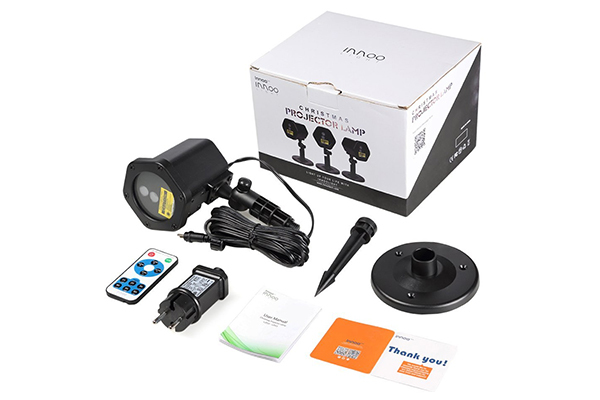 You can get the lights for use in different functions due to the different lighting modes that allow you to set them according to the mood of the activity. Hence you can use them in the combination mode, sequence, slow fade, twinkle, steady on, waves, chasing, and glowing mode. Once you get these lights, you do not have to keep presetting the mode since they include a memory function that enables them to go back to the previous lighting mode the next time you turn them on. Whats more is that you can be sure to save on energy costs due to their low power consumption. The bulbs have a 3.2V low output voltage. This makes them safe to use in homes with kids who are likely to keep holding them since they will never heat up. They emit a warm white light perfect for use in an indoor setting. 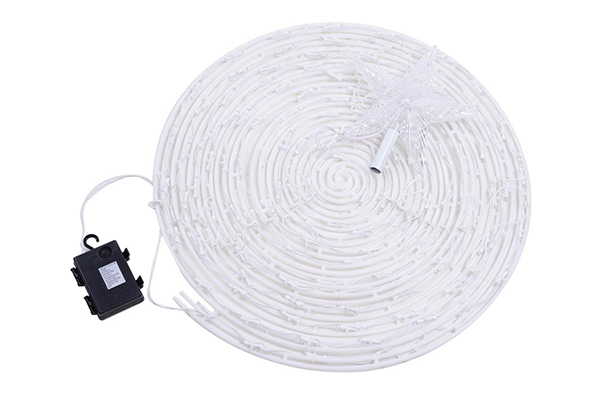 As one of the best Christmas light set in our review, these are cool white LEDs fixed on a 6ft cord. 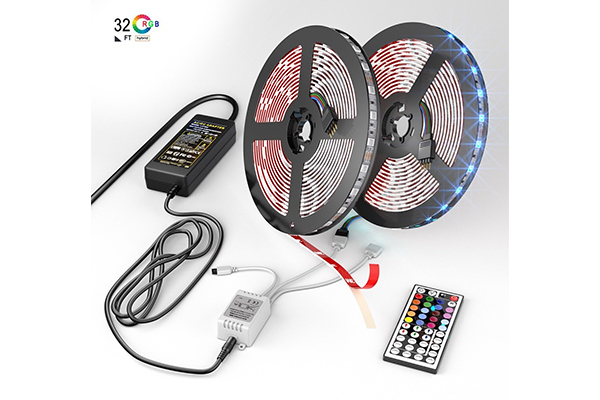 This cord features 182 bulbs that require 3AA batteries to operate. However, note that the batteries are not included. 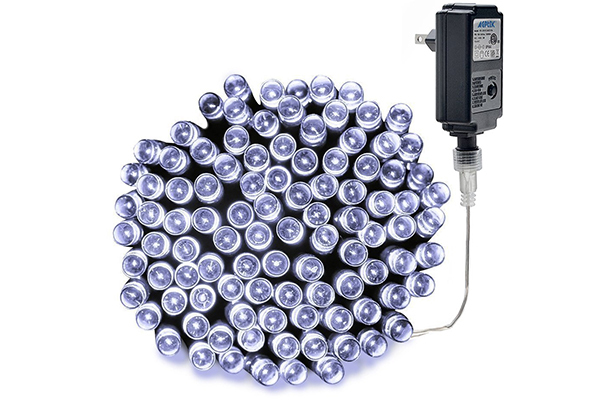 The lights are safe to use since they are CE, PAHS, and RoHS certified. Whats more is that they are safe for use in an outdoor setting considering that they are IP44 rated. They feature seven attractive lighting effects where six are flashing while one is a steady lighting. More to that is that they include a built-in timer which enables them to remain on for six hours and off for 24 hours. The lights can serve you for an extended period due to the strong and durable plastic and steel construction. They come with ground stakes that provide a secure ground placement. Featuring a mountain base and spike, these are some of the best Xmas lights to buy when you want to get lights that are easy to install. You simply need to install them indoors or outdoors with the included accessories in less than five minutes. 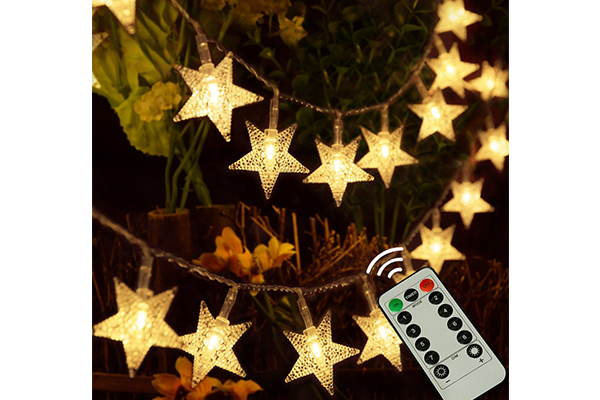 After that, select the pattern and design the lights should feature by using the provided remote control and enjoy the warmth of the lights. The lights are weather resistance and safe to use. They feature an IP65 waterproof material so that you will never have to worry about rain, snow, dust or intense sunlight. Whats more is that is that they feature a built-in temperature protection as well as a working temperature that ranges from -13°F-104°F. This makes them suitable to be incorporated into most environments. The lights are FDA and ETL certified to ensure that they are safe to use. With them, you can benefit from a wide lighting projection distance of over 2500 square feet from 30-40 feet away. You can control them with a radio frequency wireless remote control at a range of up to 15meters so that they are highly convenient for you. They feature a spinning option allowing you can choose the laser lighting effects between strobe, freeze or rotate at a projection angle of up to 120 degrees. Whats more is that they have several color choices including red, green, and red and green to enable you to select that to suit your mood. The lights have a built-in timer that lets you choose how long they will stay on from one to six hours. You can get them for Christmas, birthday parties, Halloween, weddings, among other activities. They include two interchangeable bases. Waterproof and suitable for outdoor and indoor use. As one of the best lights for Xmas, this light set has passed FCC/CE/FDA certification making them safe to use and environmental friendly. 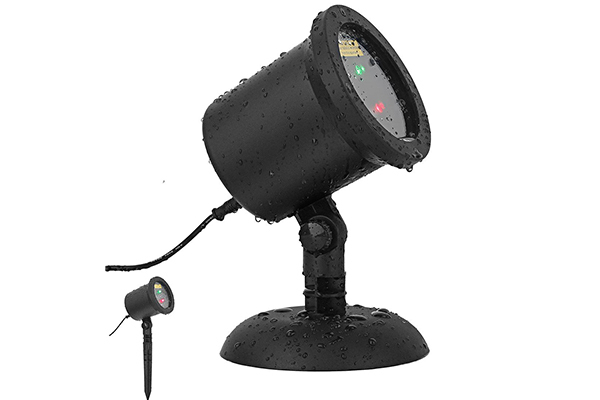 They are IP65 waterproof rated which assures you that they are safe to use in all weather conditions be it in the rain or snow. Whats more is that they are coldproof with a working temperature of -20°C to 40°C. As such, you can be sure to have minimal light failures. The lights feature two colors which are red and green. This makes them colorful and as such suitable for Christmas decorations, nightclubs, shopping malls, family gatherings, among other functions. You can adjust the lights up to 180degrees so that they can cover a distance of up to 2100 square feet from a 25feet distance. They feature a built-in light sensor so that they can turn on and off automatically based on the intensity of the light. With them, you can be sure to save a lot of energy expenses while compared to regular light strings. These lights make the best Christmas lights when it comes to setting them up. They come with an extra adhesive 3M red tape, IR controller, power adapter, and connectors, as well as a remote controller that makes them easy to set up and use. Due to the included adhesive, you can connect the lights to high, low, and medium plastics, metal and glass and be sure to have them remain intact. Whats more is that they feature cutting marks after 3LEDs so that you can cut them when the need arises and be sure that you will not damage the rest of the strips. The lights have a dimming and brightness control that make them suitable for indoor lighting and decor. You can get them for weddings, bedrooms, kitchen, garden, balconies, among other places. However, be careful to avoid exposing them to water. 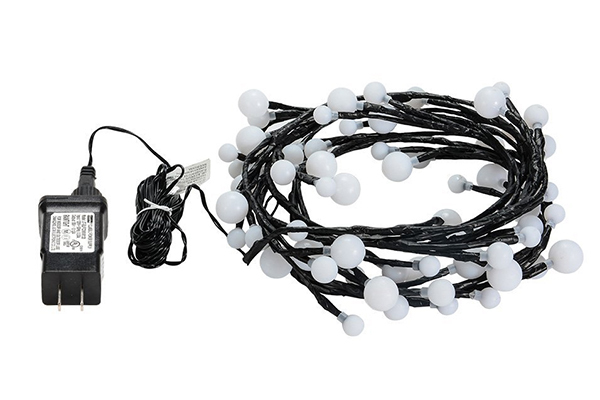 As the best lights for Christmas in our review, the Oakleaf string light features 30 individual LEDs on a 9.8ft long cord. 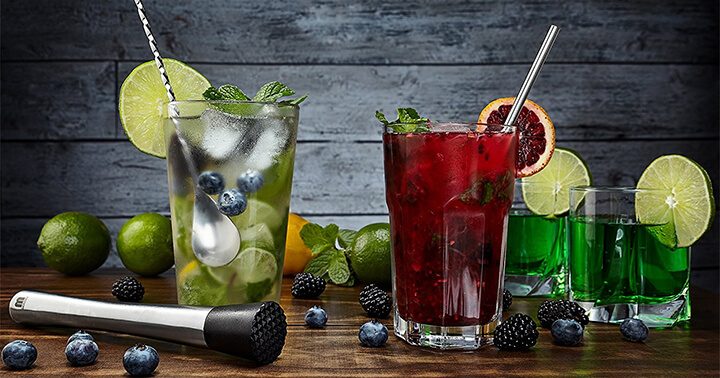 This makes it perfect for parties, weddings, among other occasions. The lights require 2 CR2032 batteries which are replaceable and included in the package making them a reliable set of Xmas lights. With the included batteries, you can enjoy the warmth of the lights for more than 64 hours on a non-stop operating time. The lights are easy to set up since no wiring is needed. They have a heat-insulated copper wire that makes them safe to use. Whats more is that they feature a low heat insulation to ensure that the LEDs can remain cool after long hours of using them. The lights are made of bendable copper wire that is flexible so that you can mold the lights in the shape that you desire. This allows you to install them on the bed, staircases, trees, gardens, furniture, among other areas. However, they should not be submerged in water at all means. The Xmas lights reviewed above have what it takes to give you a bright festive season. They are durable, reliable, and reasonably priced. So, give them a try for you to benefit from the warmth of the best lights for Christmas.